Good bicycling infrastructure is something few on this continent have seen. It doesn't mean a "bike route" sign and a white stripe along the arterial. It doesn't mean a meandering trail shared with joggers, strollers, and skaters. Bike friendly means a complete, continuous, interconnected network of named bicycle roads or "tracks", each marked and lit, each governed by traffic signs and signals of its own. It means a parallel network interlaced with the other urban grids: the transit grid on road or rail; the street grid for cars, trucks, and taxis; and the sidewalk grid for pedestrians. It means separation from those grids: To be useful for everyone from 8-year-olds to 80-year-olds, bikeways on large roads must be physically curbed, fenced, or graded away from both traffic and walkers. (On smaller, neighborhood streets, where bikes and cars do mingle, bike friendly means calming traffic with speed humps, circles, and curb bubbles). Picture a street more than half of which is reserved for people on foot, bikes, buses, or rail; on which traffic signals and signs, street design, and landscaping all conspire to treat bicycles as the equals of automobiles. 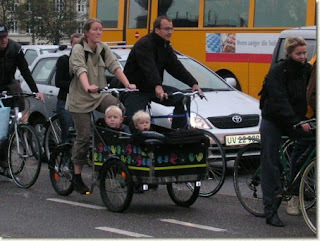 This is what bike friendly — what Bicycle Respect — looks like. Such "complete streets" are common in Denmark, the Netherlands, and other northern European countries. Copenhagen has more than 200 miles of "bicycle tracks" and another 40 miles planned or under construction. You can see photos of what I mean here. These tracks, which are typically above street grade and below sidewalk grade, can move six times more people per meter of lane width than motorized lanes of Copenhagen traffic. That's right: Because cyclists can travel close together, bike tracks have higher traffic "throughput" than do car lanes. Copenhagen has even synchronized traffic signals — for bikers. An average-speed bike commuter going downtown will rarely see a red light. What does bike friendly look like? It looks like a 60-year-old and her granddaughter on two-wheelers, getting the green light at each intersection they approach, while drivers brake to stay out of their way. What does bike friendly look like? Watch this video to see. Though it's Big Apple-centric, it includes footage of physically separated bike lanes from around the world.